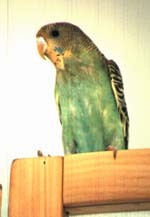 Nazo is an adorable green parakeet born August 20, 1997. We got her at barely 6 weeks, hand raised and fed. She started out cute and cuddly, on our fingers from Day 1. If you're buying a parakeet, get a hand raised one if you can! Practically no training time at all. Nazo was named after the "Big Nazo Band", a great puppet band (with big noses) that sings Rock & Roll in Rhode Island. I've gotten several messages from people in the middle east who are named Nazo - apparently there it means "dear" or "little one". Jan '98, baby Nazo This is baby Nazo - her 1998 adventure are here. During 1998 we hand trained Nazo, taught her to enjoy showers, to hang out on our shoulders, and become part of our family. Like all new parents, we wrote about her quite regularly! Jan '99, Teenaged Nazo We kept up our regular journal of Nazo through 1999 when Nazo was a "teenager". During this year Nazo went from a cuddly baby to a cranky teenager. Then we got her a friend - Pinto - and suddenly Nazo was the poor picked-on one. Later in the year, growing into adulthood, Nazo again became shoulder-happy and friendly. By 2000, with our three-bird flock, we stopped doing our detailed journals of their lives :) The birds have all settled in together and are truly a flock now. They preen each other, fight with each other when they're grumpy, and warble together as they fall asleep. We adopted a cat with claws, so the birds no longer have the run of the house. Instead, they live in a very large cage in my home office, where I am all day. They're allowed out in this room with the door closed when I'm in there, but that's the only area they can go to now. Important note when you have multiple birds - don't set up situations so they feel they have to fight! We definitely need 3 food dishes so they each feel content while they eat, and 3 bathtubs so they can all splash together. Birds are flock creatures, and they really like to do things together, at the same time. Sadly, Nazo passed away on September 21st, 2008 - just over 11 years old. By that point one of her claws was twisted and permanently broken, and she had become unable to fly for about a full year. She couldn't fly out of the cage - only "gently plummet". 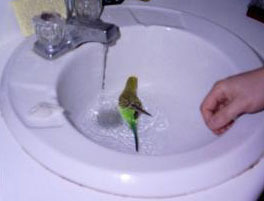 She couldn't get up on top of the cage to take a bath any more, which she used to adore. She was definitely in her old age, but we nursed her through it and helped her final months be as comfortable as we could.